Today’s PhD Comics covers how the SciQuester and general crumminess of the science funding climate is affecting young scientists. 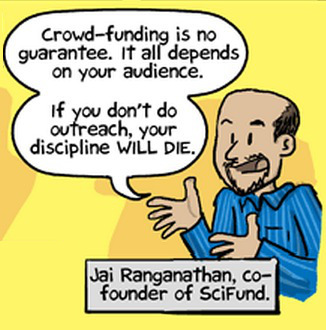 In particular, it has a brief discussion of crowdfunding, and a great video interview with our own Jai Ranganathan. I personally love Jorge Cham’s portrayl of Jai (shown above). Nice work! What are you waiting for? Check out the strip!